Soft shell crabs are a springtime delicacy in North Carolina. The season starts with the first full moon in May when the crabs begin molting to accomodate summer growth. A few weeks later, most crabs have a new hard shell for the year and harvesting stops. Don’t let the limited harvest season limit your enjoyment of soft shells! Softies freeze exceptionally well. They retain the texture and flavor of fresh soft shells, tasting almost as good as the day they were harvested. They are easy to defrost and prepare, plus blue crabs are packed with nutrients like vitamin B12, selenium, zinc, and omega-3. Locals Seafood freezes all sizes of softies in the spring and summer, shortly after they are plucked out of the water. 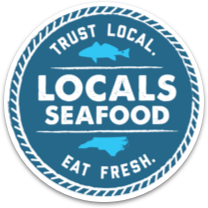 It’s always a good idea to check our Today’s Catch page or call to make sure we have them in stock before heading to the market. Remove the crab from the freezer and place it on a plate in the fridge. Let it thaw for a few hours. Remove it from the packaging once it has thawed and rinse the crab before cooking. Now you’re ready to fry ’em up! There are many methods for preparing soft shell crabs. A helpful starter guide is Mark Bittman’s Three Methods, Four Coatings, Five Sauces for preparing softies. A simple fried softie is achievable using cornmeal & Old Bay or a store-bought seafood breading. Once breaded, cook in hot oil for ~1 minute on each side. Fried soft shells are excellent on a sandwich, atop pasta, or across a bed of arugula. If serving on a sandwich or on their own, tartar sauce is imperative. Next time you are craving a soft shell crab in the fall or winter – don’t despair. Check out our Today’s Catch page to see if we have any frozen available.